od 30 do 90 min. The Great Khan is dead, plunging the world of Eretsu into total war as the Khan’s heirs square off against outsiders and each other for control of his shattered Dominion. The combatants’ most fearsome weapons are Golems, magically animated behemoths created and piloted by powerful sorcerors. 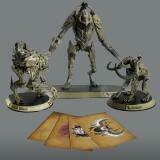 Now it’s your turn to take control of a Golem army to fight for the honor of your liege! 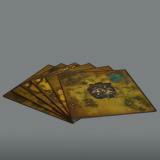 Golem Arcana™ is a digitally-enhanced miniatures boardgame. Powered by the Tabletop Digital Interface (TDI) Stylus and your smartphone or tablet, Golem Arcana combines the social and tactile joys of the tabletop with the ever-evolving dynamics of online gaming to deliver an experience that is rich and flexible, yet fast-playing and accessible. The free Golem Arcana App referees the game and automatically takes care of all the record keeping as well as providing immediate information on any figure or location on the board. 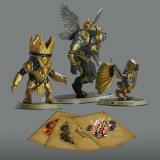 Combine Golem figures with digital sorcerer Knights and Ancient Ones to build an army that expresses your strategy and tactics. New scenarios, knights, and Ancient Ones, are regularly release,d and available for download, to provide new challenges and tactical options. 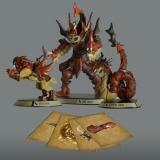 Join forces with your fellow players all over the world to determine the fate of Eretsu. The outcome of storyline scenarios impacts the ongoing saga and helps chart the course for future game scenarios and other developments. 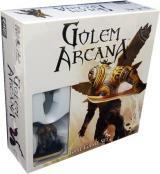 Golem Arcana scales from small skirmishes to massive assaults, start with the six figures in this box and then grow your army with additional figure sets. A typical battle lasts about an hour and gives each player command of an army of Golems, the sorcerer Knights who master them, and the Ancient Ones who lend supernatural support.